Whenever you buy a new phone, the most concerned thing that you have is not to lose your WhatsApp chat, and it’s media stuff. 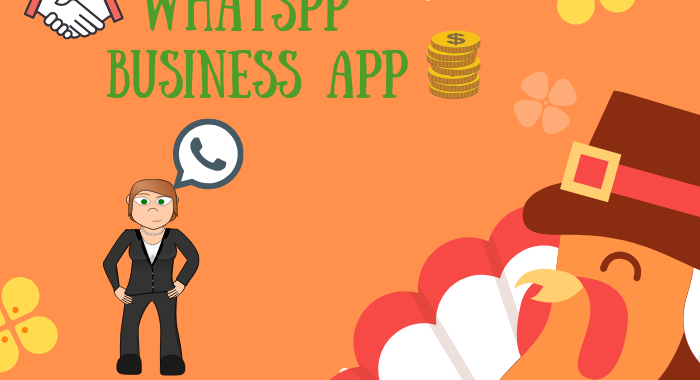 You usually take the help of shopkeeper to transfer all the required data of WhatsApp along with other mobile data (contacts, messages, apps) securely, so that you don’t lose any chats, media files as they are essential. But you know what you can migrate the WhatsApp data on your own. 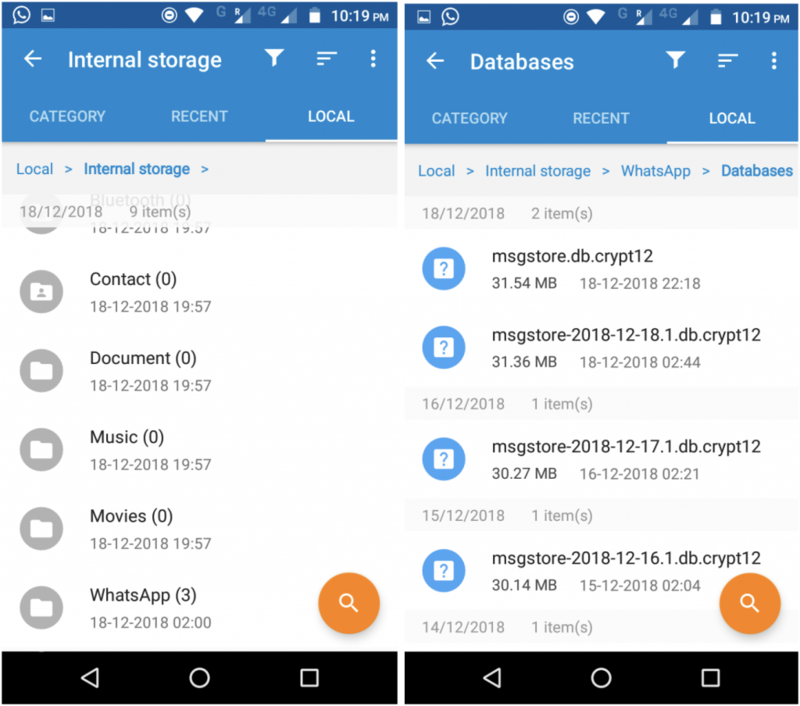 In this tutorial, we will show you how you can easily transfer WhatsApp data from one Android Phone to another. 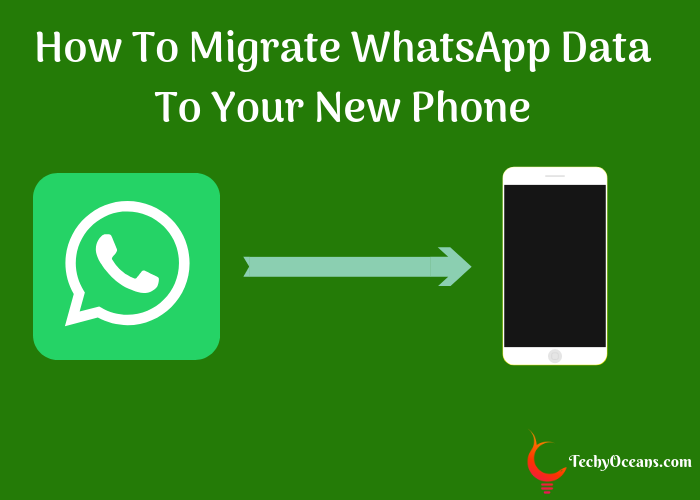 How To Migrate WhatsApp Data To Another Phone Easily? Drop your worries to lose access to your WhatsApp conversations and media. Though a new phone helps you to start again, WhatsApp is something you would still want to start with the old one. 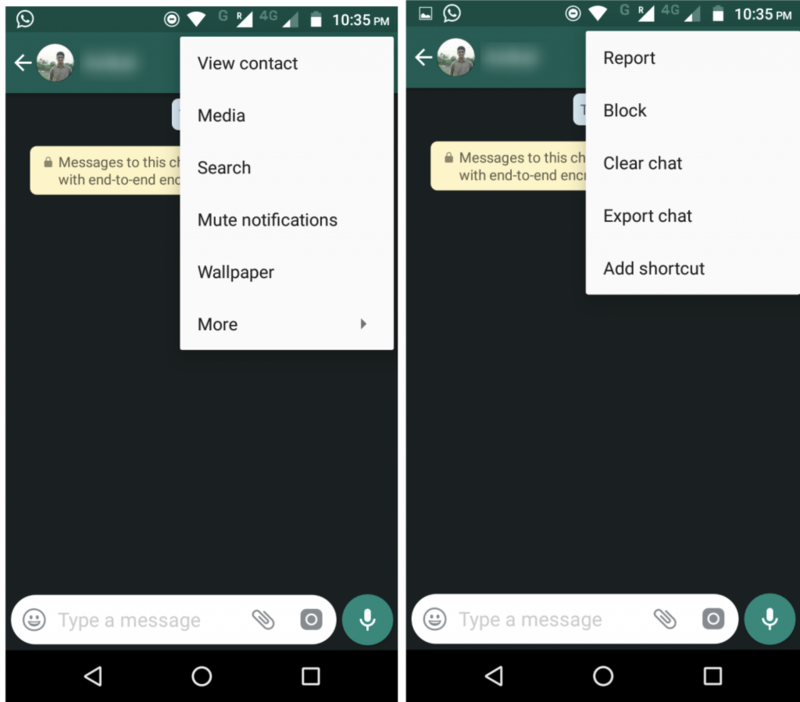 Just so you don’t lose access to your old WhatsApp conversations, here we have covered the two easiest methods by which you can migrate WhatsApp to a new phone. You can use any one of the methods as per your convenience. Just in case, if you are an iPhone user and wants to migrate WhatsApp data from iPhone to Android, we have it covered as well. NOTE: WhatsApp doesn’t support the cross-platform transfers, we will also talk about how you can still have access to your old chats. Local Backup gets saved by default on every WhatsApp application. Every night at 0200 hours, WhatsApp automatically creates a local backup in your phone. Menu Button > Settings > Chats > Chat backup > Back Up. You will see when the messages were last backed up and an option ‘Backup’ to do it now. 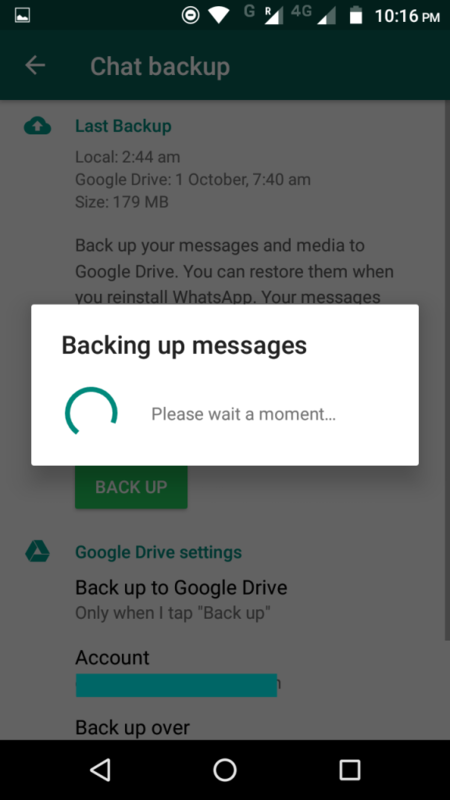 After clicking ‘Back up’, the process starts displaying ‘Backing up messages’. It takes a few seconds to store the latest backup. You will have two options here. One option is to backup chats on local memory on your phone and second is to save conversations on Google Drive. It is a safe option always save your chats on Google Drive in case you lose your phone. Your backup will be saved either on internal memory or SD Card (memory card). To migrate your data, you should change the backup location to the SD Card. Note: If you do not want your messages to go to Google Drive, uncheck the box showing the same. Install WhatsApp application on your new mobile phone. In the external memory card/SD card slot of your new phone, insert the SD Card. You can take the same from the old phone and add it to the new phone. If your new phone doesn’t have an SD card slot or only have internal memory, then you will have to transfer data through a computer. To do that, please connect your old phone to the computer through a USB Cable. Then copy the WhatsApp folder from your old device to the computer. Now connect your new phone to the computer and transfer the replicated WhatsApp folder (that contains your backed up messages) to your new phone. Now, launch WhatsApp on the new phone and verify with the same number that you backed up at last. Follow the WhatsApp verification process. It takes a few minutes, and a pop-up will appear as ‘Restoring messages’. PS: If you are transferring files via Local Back, you have to make sure that the WhatsApp Database folder is in Internal Memory before you Launch WhatsApp in your new device. Google Drive Backup is nothing but storing your WhatsApp messages directly to the Google Drive account on your Android Phone. 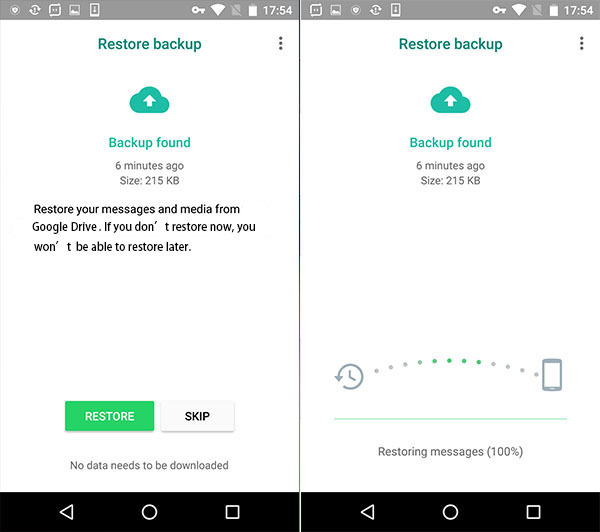 This recent change in WhatsApp has made backups easier for its users. 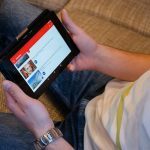 Your android phone runs on a Gmail Account that is synced to your phone, and every Gmail Account has a Google Drive Account. 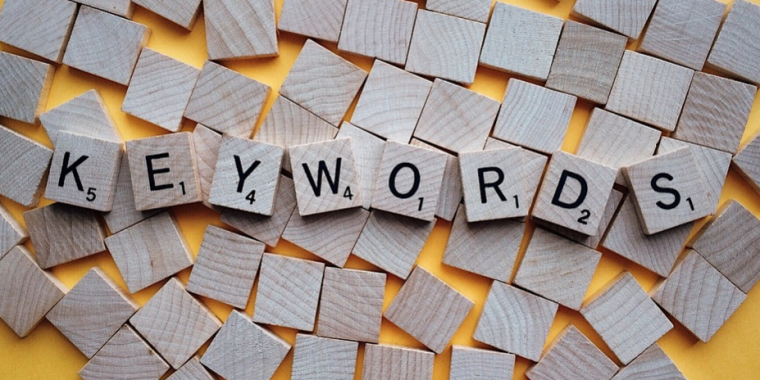 So, you don’t have to create a different account for this method. Your Google Drive Account comes with a 15GB of free storage and can easily store WhatsApp Messages Backups. 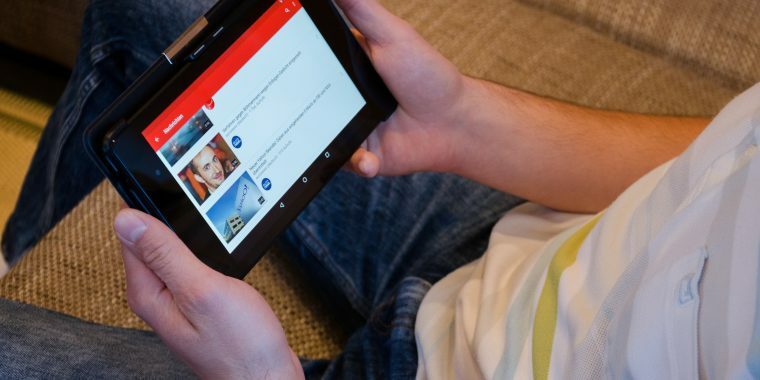 Check if your device is in sync with your Google Drive account. Your Google drive account must have enough space for backing up the messages from WhatsApp. Open WhatsApp and then go to Settings > Chats > Chat backup > Back Up. You will have to include the account of Google Drive under ‘Google Drive settings’. Add the same account under Google Drive settings and the same phone number, while installing the application on your new phone. During verification, you will see a pop-up message to restore texts and media from Google Drive. It takes a few minutes to restore messages and click ‘Next’. Once the restoration is complete, you can use WhatsApp with all your recent texts and media. PS: FactoryReset removes WhatsApp history, and thus you need to take a WhatsApp backup on Google Drive or iCloud. 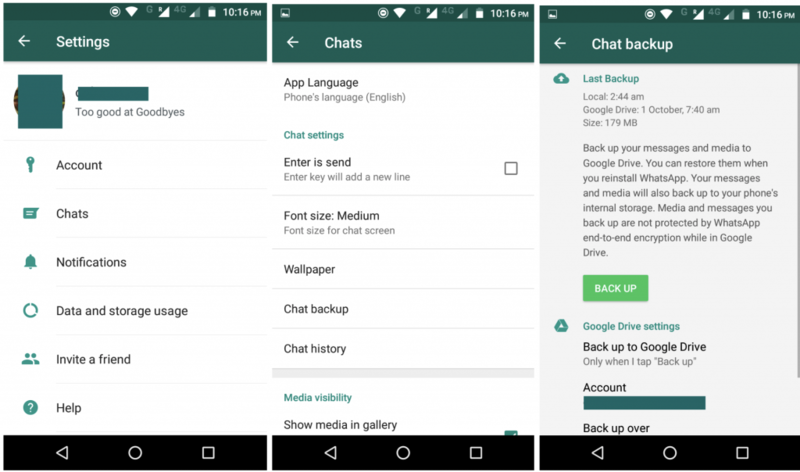 This will allow you to quickly restore Google Drive WhatsApp backup to Andriod and iCloud backup to iPhone. 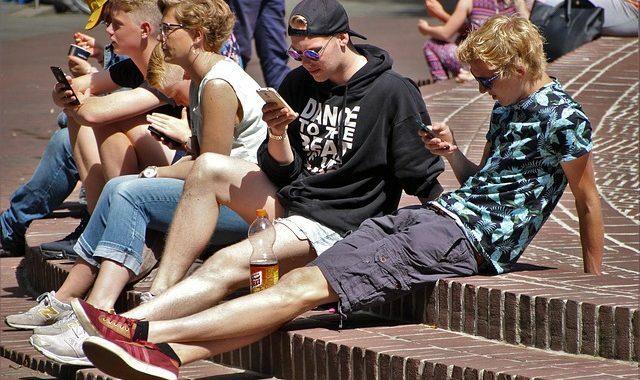 WhatsApp backup from Android to iPhone or iPhone to Android requires third-party software as transferring of chats from Android to an iPhone, or vice versa is not offered from the company’s side. This means you can’t use Android WhatsApp back restore to new iPhone or vice versa. Even if you download the iOS Google Drive, the iPhone WhatsApp application uses the only iCloud for backup. Thus third party apps are the only option if you want to use your WhatsApp from an old Android/iPhone device to the new iPhone/Android device. But this doesn’t mean you can’t have access to your old conversations. If you wish to still access your old conversations from WhatsApp, you can email these chats or save them on Google Drive. This is free of cost, and it’s easy. Launch WhatsApp and then open the chat you wish to keep. Go to Menu > More > Export Chat. At this point, you will be asked to either export Without Media or Include Media. This depends if you still want media (Images, videos, documents) of the chat. Choose the app which seems fit for you. 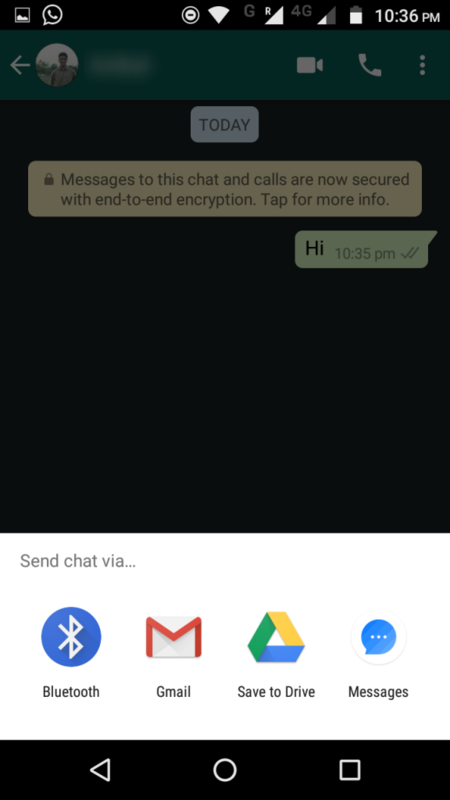 Once you save chat to Drive or email it yourself, you will have access to the WhatsApp chat forever. Applications like iCloud (supported by iPhone WhatsApp only) can be used by iPhone users to transfer chats to their new iPhone. Similarly using Google Drive (supported by Android Google Drive WhatsApp only), Android users can transfer their chats to their new phone. Migrating WhatsApp data between Android is secure if you have access to your old device. In case you have lost your phone, and you want to access texts and media from your stolen device, read our blog on Restoring WhatsApp when your phone gets stolen, here. 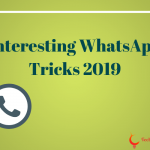 We hope you like this tutorial, and it helps you to transfer your WhatsApp data to your new phone quickly. If you have any doubts or queries, feel free to let us know in the comment section below.